I get home Thursday evening from my business trip and start flipping through Paula Wolfert’s “Mediterranean Clay Pot Cooking” to pick a recipe to try out. 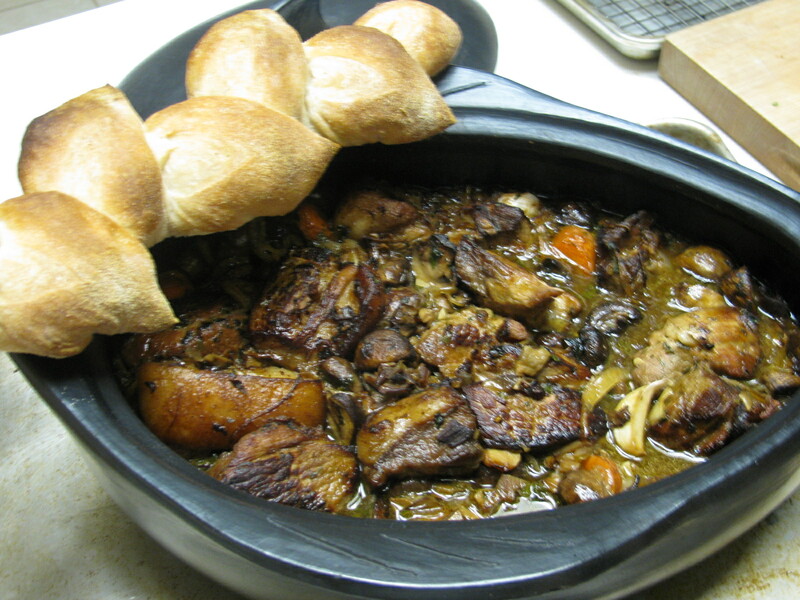 I quickly settled on the “Pork Daube with Wild Mushrooms“. It just sounded right and flavor profile was very attractive with lots of dried Porcini, white sweet wine, herbs, juniper and of course pork. Daube refers to a number of Southern French stews, in my experience, usually the end result is not as wet as what we commonly think of as stew but is very intensely flavored due to long slow cooking and -usually- cooling the meat in the stew before cooking it again to reduce the juices and concentrate the flavors. I started working on this Friday evening for a Sunday dinner. Sure, it needs some forethought, but most of the work is quick and most of the time spent is simply marinating the meat and gently simmering it. So, Friday night I marinated the pork shoulder in a mixture of Gewrztraminer, onions, carrots, a spice sachet that included juniper, lavender and pepper, and an herb bundle. That’s all for day one. Like many a French stew the next step involved draining the meat and reserving the marinade. 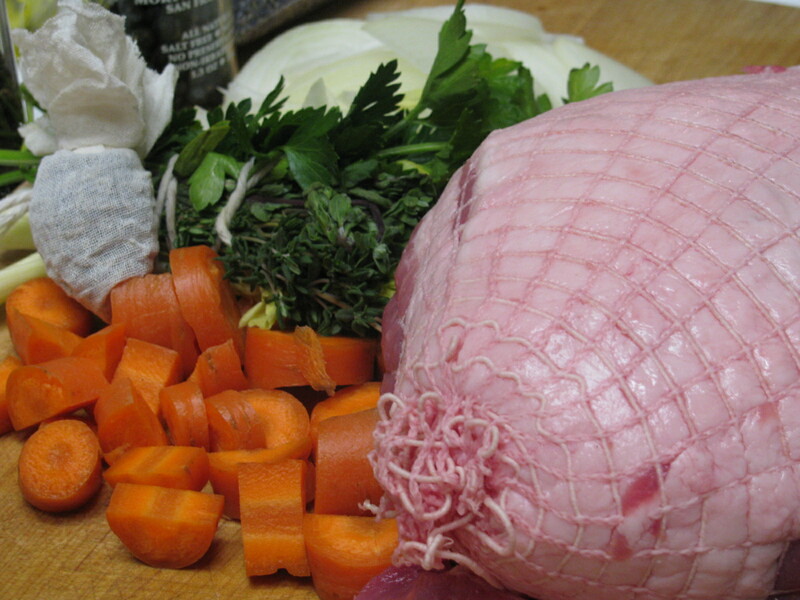 The meat is then browned and transferred to a clay pot along with browned onions and carrots. Lining the clay pot are several pieces of fresh pork skin. The skin here will add tremendous body to the resulting stew due to it’s very high level of unctuous collagen. The reserved marinade is simmered with dried porcini soaking water to make a fragrant flavorful braising liquid (the house just smells heavenly due to the dried porcini – simply amazing stuff). After topping the meat in the pot with the braising liquid, the whole thing goes in the oven for a couple of hours, then it is cooled until the next day. A few hours before dinner, I saute a bunch of cremini mushrooms and toss them in with the meat. Then it goes back in the oven for a few more hours until dinner time. The end result is deeply flavored with what I think of as “winter forest flavors” (dried and fresh mushrooms, juniper, thyme, pork, wine). The cooking juices where rich and delicious and the meat amazing. I served this with nothing more than homebaked French bread. First, and this is true of any dish cooked in a clay pot probably, clay pots differ a lot in conductivity. I used a Colombian La Chamba pot not a Daubiere like Paula does. I ended up having to cook the dish a couple of extra hours at 250F to get to the proper tenderness. So plan accordingly and give yourself some more time than the recipe specifies. Second, There is an error/omission in the recipe. The dried porcini, after being soaked, drained and chopped are never used. I confirmed with Paula that these need to go in the pan in step 6 along with the onions and carrots. Like all stews or daubes, this is so much better the next day in more ways than one. More on that later. Previous Previous post: I am Published!